SAP helps run your business. SAP NetWeaver is a powerful platform for your ERP requirements; SAP Business Objects Software is a market leading BI solution. Business Objects enables companies to discover and share insight to make optimal decisions. Both are built on SOA architectures that deliver adaptable, flexible, open IT for developing services-based, enterprise-scale business solutions. But network bottlenecks can severely affect SAP performance. ERP and Business Intelligence are essential to your success. Read this and learn how to improve productivity and decision-making. 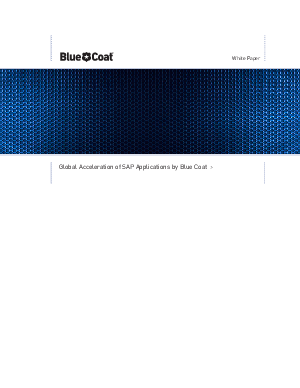 You'll see how Blue Coat WAN Optimization leverages proven solutions to achieve dramatic reductions in latency and bandwidth consumption.